Bioengineers at the University of California, San Diego have developed an electrical graphene chip capable of detecting mutations in DNA. Researchers say the technology could one day be used in various medical applications such as blood-based tests for early cancer screening, monitoring disease biomarkers and real-time detection of viral and microbial sequences. The advance was published in Proceedings of the National Academy of Sciences. "We are at the forefront of developing a fast and inexpensive digital method to detect gene mutations at high resolution—on the scale of a single nucleotide change in a nucleic acid sequence," said Ratnesh Lal, professor of bioengineering, mechanical engineering and materials science in the Jacobs School of Engineering at UC San Diego. The technology, which is at a proof-of-concept stage, is a first step toward a biosensor chip that can be implanted in the body to detect a specific DNA mutation—in real time—and transmit the information wirelessly to a mobile device such as a smartphone or laptop. The team led by Lal, who serves as co-director for the Center of Excellence for Nano-Medicine and Engineering, a subcenter of the Institute of Engineering in Medicine (IEM) at UC San Diego, and Gennadi Glinsky, a research scientist at IEM, developed a new technique to detect the most common genetic mutation called a single nucleotide polymorphism (SNP), which is a variation of a single nucleotide base (A, C, G or T) in the DNA sequence. While most SNPs have no discernable effect on health, some are associated with pathological conditions such as cancer, diabetes, heart disease, neurodegenerative disorders, autoimmune and inflammatory diseases. Current SNP detection methods are relatively slow, expensive and require the use of cumbersome equipment. "We're developing a fast, easy, inexpensive and portable way to detect SNPs using a small chip that can work with your cell phone," said Preston Landon, a research scientist in Lal's research group and co-first author on the PNAS paper. The chip consists of a DNA probe embedded onto a graphene field effect transistor. The DNA probe is an engineered piece of double stranded DNA that contains a sequence coding for a specific type of SNP. 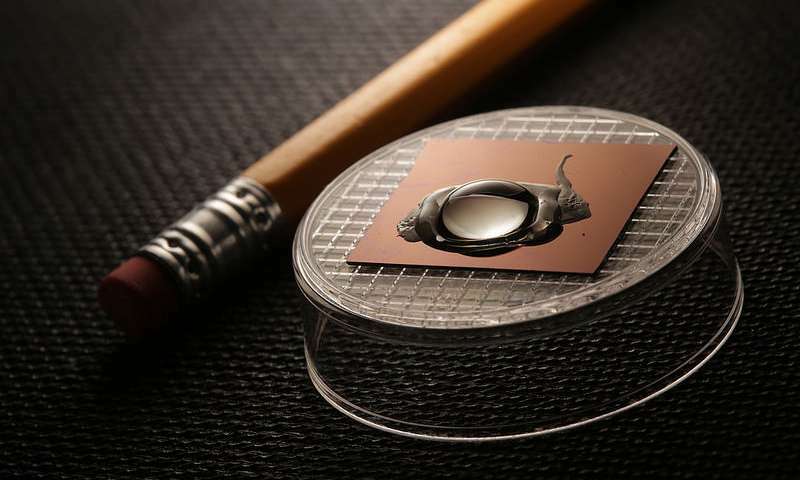 The chip is specifically engineered and fabricated to capture DNA (or RNA) molecules with the single nucleotide mutation—whenever these pieces of DNA (or RNA) bind to the probe, an electrical signal is produced. The chip essentially works by performing DNA strand displacement, the process in which a DNA double helix exchanges one strand for another complementary strand. The new complementary strand—which, in this case, contains the single nucleotide mutation—binds more strongly to one of the strands in the double helix and displaces the other strand. In this study, the DNA probe is a double helix containing two complementary DNA strands that are engineered to bind weakly to each other: a "normal" strand, which is attached to the graphene transistor, and a "weak" strand, in which four the G's in the sequence were replaced with inosines to weaken its bond to the normal strand. DNA strands that have the perfectly matching complementary sequence to the normal strand—in other words, strands that contain the SNP—will bind to the normal strand and knock off the weak strand. Researchers engineered the chip to generate an electrical signal when an SNP-containing strand binds to the probe, allowing for quick and easy SNP detection in a DNA sample. Researchers pointed out that a novel feature of their chip is that the DNA probe is attached to a graphene transistor, which enables the chip to run electronically. "A highlight of this study is we've shown that we can perform DNA strand displacement on a graphene field effect transistor. This is the first example of combining dynamic DNA nanotechnology with high resolution electronic sensing. The result is a technology that could potentially be used with your wireless electronic devices to detect SNPs," said Michael Hwang, a materials science PhD student at UC San Diego and co-first author of the study. The use of a double stranded DNA probe in the technology developed by Lal's team is another improvement over other SNP detection methods, which typically use single stranded DNA probes. With a double stranded DNA probe, only a DNA strand that's a perfect match to the normal strand is capable of displacing the weak strand. "A single stranded DNA probe doesn't provide this selectivity—even a DNA strand containing one mismatching nucleotide base can bind to the probe and generate false-positive results," Lal said. Another advantage of a double stranded DNA probe is that the probe can be longer, enabling the chip to detect an SNP within longer stretches of DNA. In this study, Lal and his team reported successful SNP detection with a probe that was 47 nucleotides long—the longest DNA probe that has been used in SNP detection so far, researchers said. Also, a longer probe ensures that the DNA sequence being detected is unique in the genome. "We expected that with a longer probe, we can develop a reliable sequence-specific SNP detection chip. Indeed, we've achieved a high level of sensitivity and specificity with the technology we've developed," Lal said. Next steps include scaling up the technology and adding wireless capability to the chip. Further down the road, researchers envision testing the chip in clinical settings and using it to conduct liquid biopsies. They also envision that the technology could lead to a new generation of diagnostic methods and personalised treatments in medicine.